Radioactive Material (RAM) Waste is any material that has been or is likely to have been contaminated with radioactive isotopes. You are NOT allowed to dispose of any radioactive waste in the laboratory. All RAM must be disposed of through Environmental Health & Safety (EHS). Since the disposal of hazardous waste is extremely costly and highly regulated, it is very important that the rules of waste segregation be followed carefully. One of the simplest ways to minimize the cost of disposal of your radioactive waste is to keep its production to a minimum. 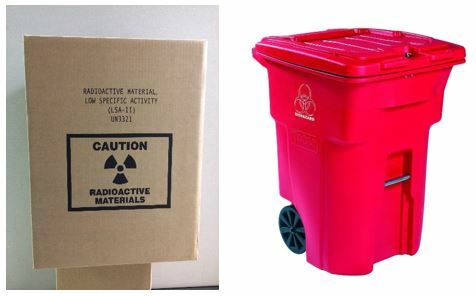 Be sure to keep your radioactive waste separate from all other forms of waste and trash. Do not mix hazardous chemicals with your radioactive waste unless it is ABSOLUTELY NECESSARY for your experiment. Mixing two separate hazard classes makes disposal even more difficult and costly. Dry Solid Materials - are typical laboratory items such as latex gloves, paper, glassware, capped biosafe scintillation vials, etc. The following materials are NOT allowed in the RAM Waste boxes for Dry Solid Materials: uncontained liquids, capped containers with > 50ml of liquid, lead (Pb), and blood-soaked items or other biological material. EHS can provide you with 1 and 2 cubic foot boxes for your dry solid waste. Note: these boxes DO NOT have needle-proof liners! DO NOT put sharps in these boxes! Use ONLY plastic "sharps containers" to collect loose sharps! Place your waste vials back into a cardboard tray for collection. Sharps - are needles, Pasteur pipettes, broken glassware, etc. Use plastic "Gator" / "sharps" containers for disposal of all sharps! These are available from EHS upon request. Once the container is full, close the lid securely, and put into a dry solid waste box. 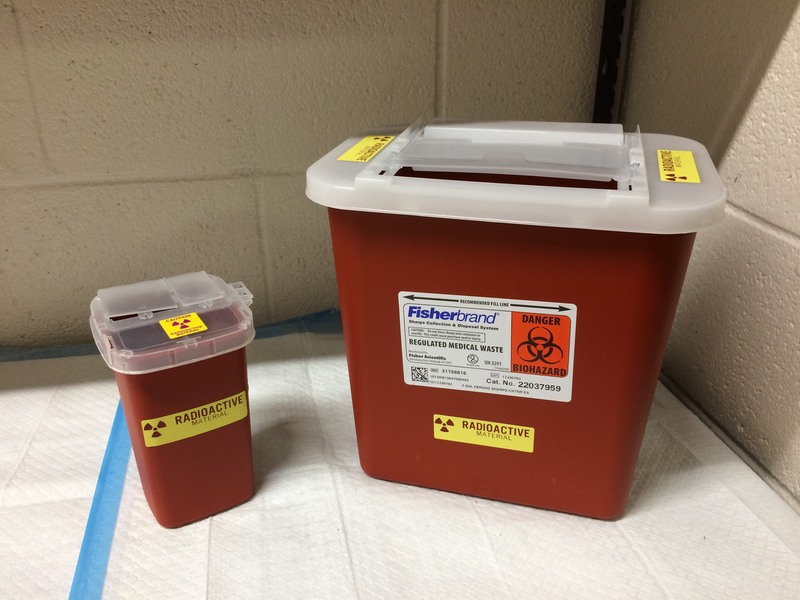 Sharps containers are available in a variety of sizes up to a 5 gallon bucket. ALL Sharps must be disposed of in these containers! Bulk Liquid Waste - is aqueous liquid waste with volume > 50ml. Do NOT put scintillation cocktail, solids, or other insolubles into Bulk Liquid Waste Containers. EHS can provide you with 1-liter wide mouth jars or 10-liter Jerry Can plastic containers for your bulk liquid waste. If you need to create or dispose of liquids with insoluble material, please contact EHS for assistance. 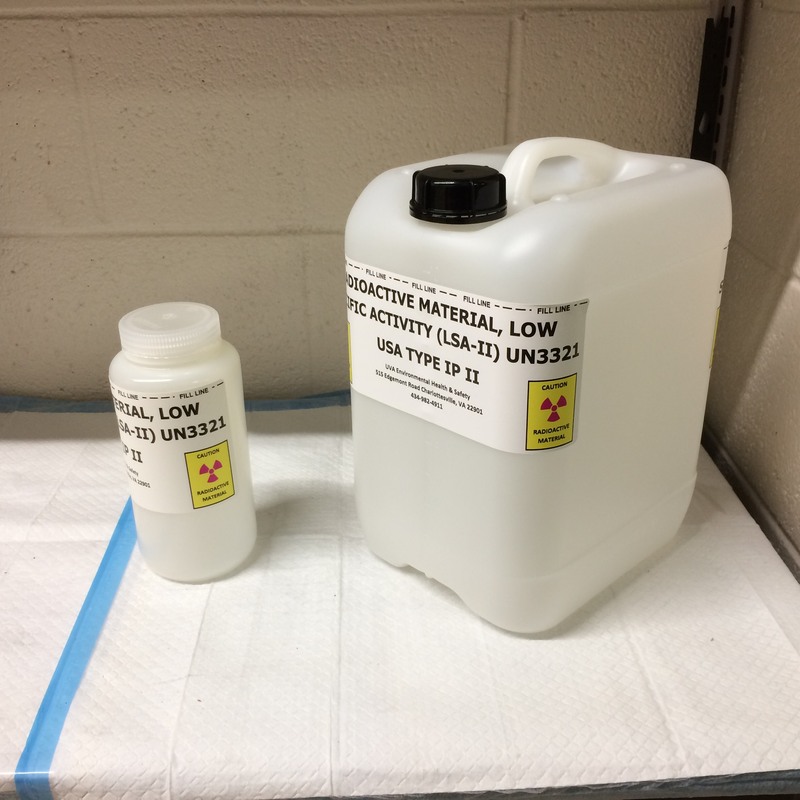 Since the University’s license does not allow labs to dispose of any radioactive waste, you are also required to put the wash water from the first 2 rinses of contaminated glassware and other small items to be decontaminated into a Bulk Liquid Waste Container. You should also count your wash water before declaring it non-radioactive and pouring it down the drain (two rinses may not be sufficient to remove all contamination). This procedure will ensure that virtually no RAM is being released to the sanitary sewer system. Remember – all liquid waste containers must be kept capped and placed in EHS provided secondary containment (e.g. trays). Mixed Waste - includes scintillation vials containing organic solvents with radioactive materials and bulk liquid radioactive waste containing hazardous chemicals (e.g. methanol, pyridine, TCA, acetonitrile, chlorinated solvents, formamide, etc.). Please consult with EHS before mixing these chemicals with radioactive material. This is the most difficult and costly type of waste to dispose of, so it is vital that its production be kept to a minimum. Uranium Waste - If uranium is ordered or used as part of research, the waste that is generated must be picked up by Radiation Safety, rather than Chemical Safety. Prior to uranium waste pick-up, a waste ticket must be completed for each container and faxed to EHS. The building and room number where the waste should be picked-up must be clearly indicated on the waste ticket. Waste containers requiring pick-up must be easily identifiable to EHS waste technicians. The quantity and composition of the waste to be picked up MUST be clearly indicated. This information is vital to EHS in order to legally transport the waste to and from our facility. Any other information considered relevant to the waste should be included in the description. Animal carcasses / pathologic waste must be disposed of in accordance with Radiation Safety policies. 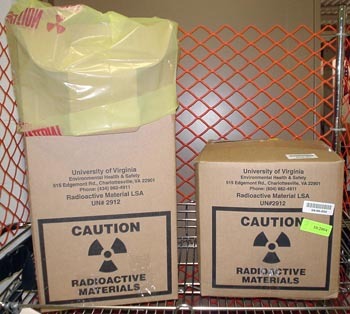 Small Radioactive laboratory animal carcasses must be placed in green or black plastic bags and labeled on the outside with "Radioactive Warning Tape". Please follow instructions on the waste ticket for pick-up. Large Radioactive animal carcasses must be placed in special radioactive waste bags and 3.7 cu.ft. boxes, or a 96-gallon Schaefer Tote. EHS provides all containers to the investigator. Containers are picked up by EHS Radiation Safety personnel. Radioactive carcasses are never to be transferred to vivaria cold rooms or freezers unless they have been commissioned by Radiation Safety for this purpose. 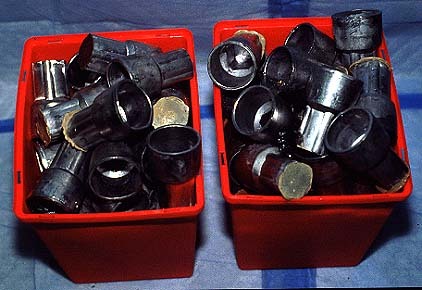 Lead (Pb) is classified as a hazardous material and is banned from disposal in sanitary landfills. 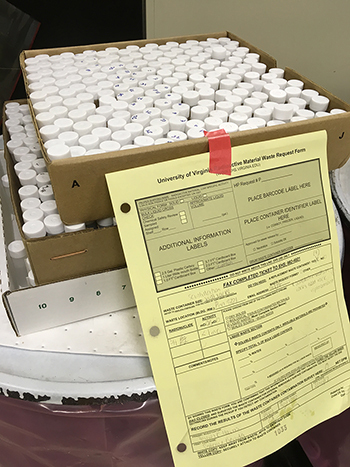 Even a small amount of lead in ordinary trash going to the landfill can be rejected and may lead to the University being denied access to the facility. Please keep all lead separate from other forms of waste and package it in a labeled cardboard box for pickup.